AM I A GOOD CANDIDATE FOR RESOLVE LASER SKIN REJUVENATION? A complimentary consultation is required prior to treatment to ensure that you are a good candidate. As we age, the body stops producing collagen. Patients seeking softer, smoother skin texture and improvement of fine lines and wrinkles will benefit from treatment. The PicoWay laser system is indicated for Resolve Laser Skin Rejuvenation for Fitzpatrick Skin Types I-IV. Clinical studies suggest that 3-5 treatments spaced 4 weeks apart in most cases will produce a significant increase in collagen remodeling. 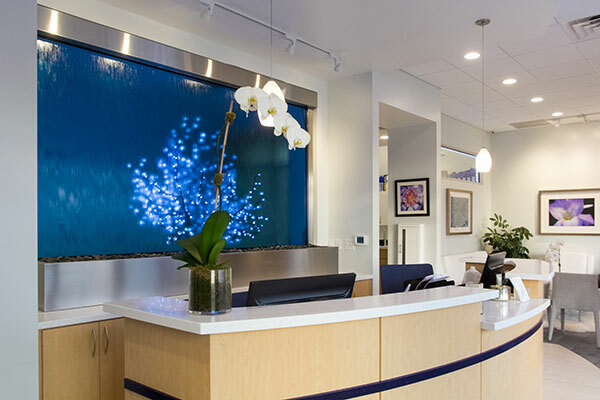 Prior to beginning your treatment, you will meet with an experienced Blue Water Spa Laser Technician to discuss your concerns and aesthetic goals. Together, you will develop a customized treatment plan based on your skin’s unique needs. Most patients will see results after just one treatment. These results will be evident in about 4 weeks and can take up to 6 months for the full result since new collagen production continues for months after the treatment. New collagen growth results in continued skin tightening and the development of a more youthful complexion with fewer lines, folds, and looseness of the skin. The frequency of appointments will be based on clinical judgment. For most patients, treatment will be performed every 4 weeks. Resolve Laser Skin Rejuvenation works by stimulating collagen production. This new collagen becomes part of the structure of the treated skin. Thus, results can last for years. We strongly recommend that our patients ‘protect their investment’ by using a high-quality, chemical-free sunblock on a daily basis, rain or shine, summer or winter. Hats are also highly recommended in the summer months. Appropriate protection from damaging UV rays can prevent the recurrence of the aging. We utilize Gentle Waves Photomodulation Light Therapy, technology used by NASA for wound healing, to accelerate the healing process. In addition, we include a soothing and healing hydrogel to facilitate advanced healing. After treatments, patients typically experience temporary discoloration or reddening of the skin around the treatment site. Make-up can be applied immediately after treatment. Because this laser technology is so gentle on the skin, many of our patients receive treatment just prior to work or during their lunch hour. The PicoWay laser is the most advanced in the world and features faster, shorter duration pulses. This means that the skin absorbs less heat, which allows for a more comfortable procedure with less downtime when compared to less advanced laser technologies. DOES RESOLVE LASER SKIN REJUVENATION HURT? Patient’s report that the treatment is surprisingly comfortable. Numbing agents may not be used in the treatment area as it can interfere with the efficacy of treatment. However, we do offer cold compresses prior to treatment to ensure minimal discomfort. ARE RESOLVE LASER SKIN REJUVENATION TREATMENTS SAFE AND ARE THERE ANY SIDE EFFECTS? Resolve Laser Skin Rejuvenation treatments target dermal repair selectively. Holographic technology delivers energy in a uniform way for reproducible results making this treatment very safe. After treatments, patients may experience temporary discoloration or reddening of the skin around the treatment site. WHY IS RESOLVE LASER SKIN REJUVENATION THE IDEAL TREATMENT OPTION? Other laser technologies use scattered light or intense heat to treat fine lines and wrinkles or acne scarring. These types of treatments require numerous treatment sessions, causes significant discomfort during treatment and, in many cases, may require more treatments to produce reasonable results. These treatments require significant downtime and increase the risk of side effects. Resolve Laser Skin Rejuvenation’s unique, proprietary mode of action has the highest peak power and the shortest pulse duration of any picosecond device on the market for superior efficacy, safety and comfort. Yes, at Blue Water Spa all of our treatments are priced per session. Each individual will respond differently to treatment- some may require more treatments while others require less treatments. Clients come back because they have great results. Not because they have a binding long term contract.